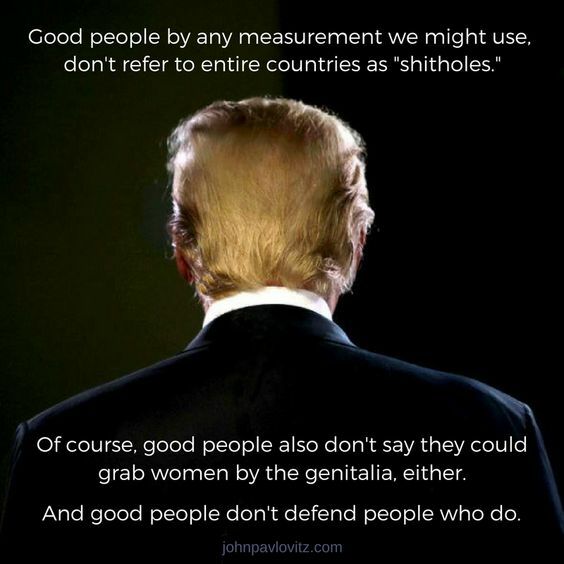 Donald Trump is not a good person. I know that. You know that. Hell, the entire civilized world knows that. As a fitting conclusion to his first year in office he and his toadies shut down our government. Reprehensible is the first word that comes to mind. He is much like a terribly spoiled three-year old who still believes he’s the center of the universe. But, this isn’t about the greedy, cheating, racist, lying, sexual predator we have as our country’s leader. This is about good people. Good people know when to stop defending those who do not deserve defending. Donald Trump doesn’t deserve defending. If you are a good person, stop defending him. This entry was posted in News & Views and tagged BLOTUS, civilized world, decency, defend, defense, genitalia, good people, government shutdown, greed wealth, leader, lying, measurement, racist, sexual predator, shitholes, toadies, vulgar on January 20, 2018 by Ray Buchanan.